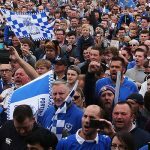 We run an annual competition for members to be a Pompey mascot for the day. 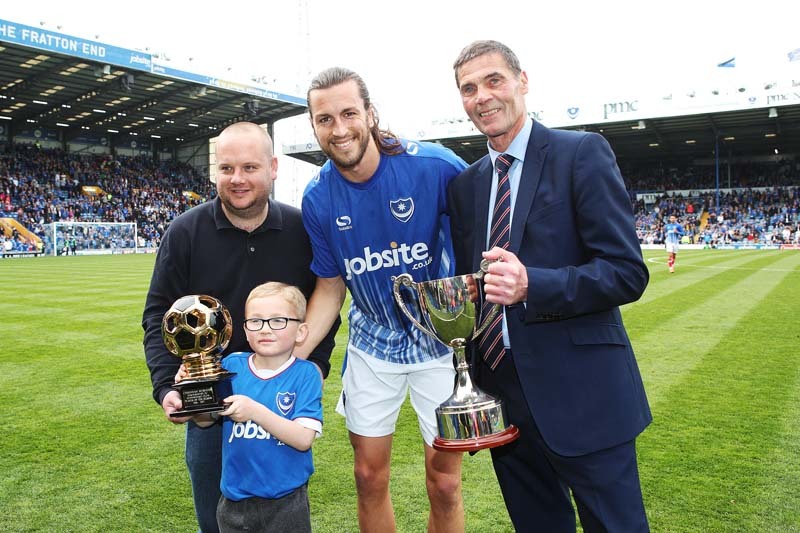 Lucky winners will receive a loan Pompey kit for the event, get to walk out with the players onto the pitch and warm up before a lap of honour before the game starts. Included are 2 x South Stand match tickets for the mascot and accompanying adult to enjoy the game afterwards. 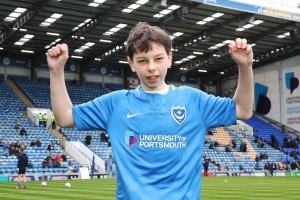 If you are interested in nominating a junior member to be a mascot, please send an email to Steve Tovey on info@pompeyfan.com with your name, address, telephone number, email address, match applying for and the junior members name and date of birth. Juniors can apply for as many games as can attend but only be selected for one per season. Mascot Games for the 2018/2019 Season. Winners and deadlines noted below when available. Please see below for the terms and conditions of the mascot scheme. Winners will be selected in a ballot done by our Chairman for the games in September and other games will be selected by a PFC guest at open meetings in a ballot. Maisy turned up in her Pompey kit, with her dad Steven who is a Season ticket- holder excited about being a Mascot. It was the 1st time she had been a mascot and hope to come out with either Conor Chaplin or Christian Burgess which were her two favourites. 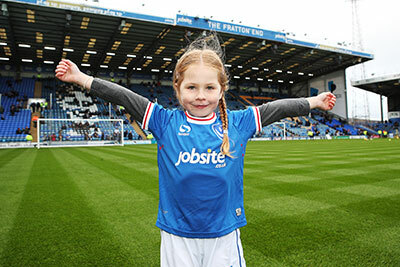 She was looking forward to playing Football with the other kids, singing “Play Up Pompey and walking around the ground clapping and waving to the Pompey fans. 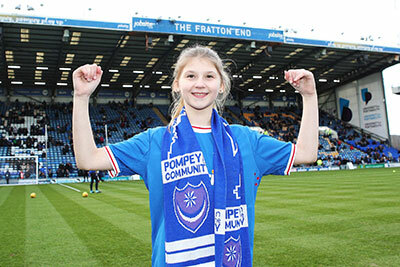 Maisy predicted a Pompey win by the odd goal or a 2-2 draw as both teams were mid-table. Maisy was even more delighted, Pompey had won and she walked out with the Captain Brett Pitman who scored the goal. Maisy had a great day and said everyone had been so nice, she loved walking around the ground loving and clapping everyone and would love to do it again if drawn out. 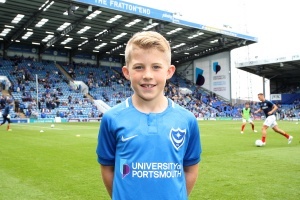 JAMES FOSS – MASCOT POMPEY V OLDHAM ATHLETIC 30/9/2017. 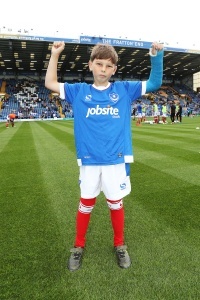 Last year James was Mascot for the Crawley Town home game, which resulting in a 3-0 win for Pompey. This year when James found out he’d been picked he was so excited he bought himself a new pair of Football Boots for the occasion. Last year James had his arm in a cast with a broken arm, so could not take part in much of the running around and kicking the ball, so this time he was really looking forward to kicking the ball about with other mascots. James was also looking forward to going around the pitch waving and clapping the Supporters as last year he was only allowed to walk half the pitch as a mascot was late. James hoped to walk out with Brett Pitman top goal scorer and Captain, as he wants to be a striker and score goals. 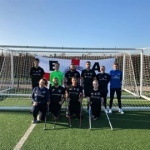 James predicted a high scoring game, with either a 3-2 win for Pompey or a 2-2 draw as both teams went into the game in a winning run and scoring goals. After the game, James said he was disappointed with Pompey’s performance and felt they should have made changes earlier, as Pompey’s team looked tired and had no spark. He thought that the injury to Nathan Thompson had rocked Pompey’s defence and affected them badly. He said that Pompey looked better in the last 20 minutes when subs Bennett and Rose came on. His favourite moments of the day were walking out with Matt Kennedy, who he said was nice and talkative to him and clapping and waving to the fans and getting applause back. Now on to your prediction James – James admitted he didn’t see Pompey losing, but did predict a high scoring game and he got it right when he said Oldham would score twice. Freddie was excited to be a Mascot again, third season running for him. 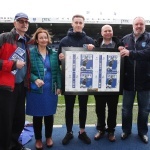 Freddie is a talented footballer himself, and a Pompey season ticket holder and wanted to walk out with Tom Naylor, who had impressed him from the Luton Town game, and believed he is the Michael Doyle player we have been looking for. Freddie predicted a 3-1 win for Pompey, and predicts Pompey to finish 5th this season, that after only 2 games, some prediction. Freddie was over the moon with the performance and result a 4-1 win, just one goal out but at least I predicted a win for Pompey. I had a great time and walked out with Anton Walkes. I really enjoyed the game today, thought every Pompey player played well, but Ben Thompson was outstanding and deserved his Man of the Match award. I think its’ going to be a good season for Pompey and we are definitely going to make at least the play-offs. Finally Freddie said he would like to pass on a big thank you to Portsmouth Supporters’ Club CB and PITC for letting him be Mascot today. WITH POMPEY MANAGER KENNY JACKETT. 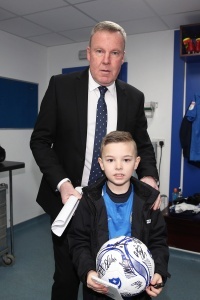 James was excited to be a mascot again, this his third time being drawn out as a Supporters’ Club mascot. James reminded me, that the previous two times Pompey had won, and he predicted a 2-0 win against Scunthorpe. James was extremely delighted Pompey won, and he reminded me, he predicted a 2-0 win, and the third time Pompey had won with him being the mascot. James came out with Omar Bogle, who he said was very nice and spoke to him. James felt the awful windy conditions spoilt the game, and felt Pompey were a lot better in the second half. James also thought Christian Burgess had a brilliant game, and was his Man of the Match ahead of Omar Bogle.